My favourite CKT. Arrrrg, I am putting on weight. Need to sign up for weight loss program. LOL. Lam Hing Leong Restaurant Whenever I crave for Penang Char Kueh Teow, I would drop by in Lam Hing Leong Restaurant in USJ14, Subang Jaya, to eat the famous Penang Lorong Selamat Char Kueh Teow there. The Kueh Teow is fried to perfection and topped with crispy fried lard, the way I like it. Drooling already……….need to go back to get my Char Kueh Teow shot! LOL. The stall is run by a husband and wife team. The wife does the frying of the Kueh Teow. 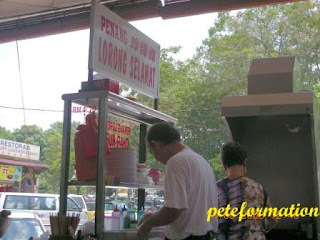 You should observe how Uncle Jimmy adds pepper and crispy fried lard on to a plate of Fried Kueh Teow……. ada style (Got style)! There is another stall in this restaurant that sells Penang White Curry Mee and Penang Kueh Teow Soup. Try it out! 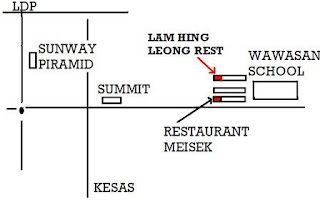 Address: Restaurant Lam Hing Leong, Jln USJ 14/1L, USJ 14, Subang Jaya Open: Mon to Sat, 7am to 2pm NOTE: CLOSE ON SUNDAY! 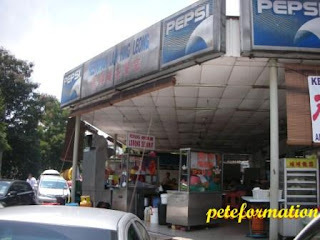 Note : Dec 2010, Noticed that the Penang Curry Mee stall is no longer there. Hmm... I like Char Kueh Teow too. Long time didn;t go to USJ oredi. Chris : Try this one, ada standard! Cleff : The taugeh in this CKT stall is the chubby type like Ipoh. Yummy leh. Aiyoh, I feel like eating CKT now leh. Long time no eat jor. I don't know char kueh teow can have such a cool name, CKT!! keke.. I really miss m'sia food!! CKT is in my food list when i go back home! Beverly : Ha Ha cool name. Looking for another good stall in KL. mcky1224 : No problem lar! Let me know when u want to go! tell me tell me how the uncle got style add the fried lard and pepper!! try the one near Wisma FAM in PJ. it is halal and pretty good. used to go there when i work there last time. yummy. mistipurple : He does it very gently, like tai chi lah! amoker : Thks for the info. I will chk it out. eunice : Enjoy yourself in Penang. Yay, to Penang food! 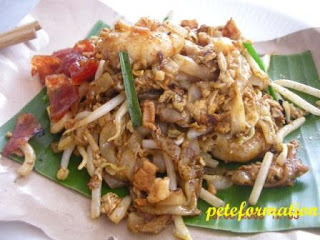 i love the char kueh teow there too! my mom's plc is in USJ14 and that's how we stumbled upon this stall. The only complaint I have is that the portion is so small. Penang Lang : Agree, the Lrg CKT is too expensive. This one in USJ 14 is RM4.50 per plate but quite small portion. Unfortunately we have to eat here when craving for Penang food! SwhereinSpore : This is a dry Penang version. Tracy : Yea, portion too small but I like the crispy pork lard. Yoo hoo....tasty, ha ha!